Once again this year by popular demand we are concentrating on actors and acting! 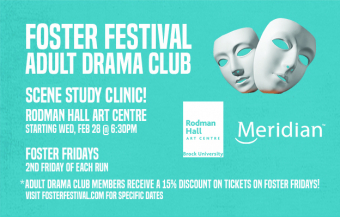 Join us at the Rodman Hall Art Centre in St. Catharines for four sessions in which we'll explore acting problems and solutions, warm-up techniques, auditioning tips, and how to bring your best game into the rehearsal room. Whether you love being on the boards, want to improve your public speaking skills and confidence, or are simply curious about what makes an acting performance memorable, you'll love our SCENE STUDY CLINIC! We will have a variety of scenes and monologues to play with but we'd love you to bring in material that you are currently working on - self-written or published, under 5 minutes please so that we can work on a number of scenes each evening. All sessions are FREE to attend. Join us for Foster Fridays at Cairns Hall in the PAC. On the second Friday of each run, Adult Drama Club members will receive a 15% discount off regular ticket prices for our three productions. 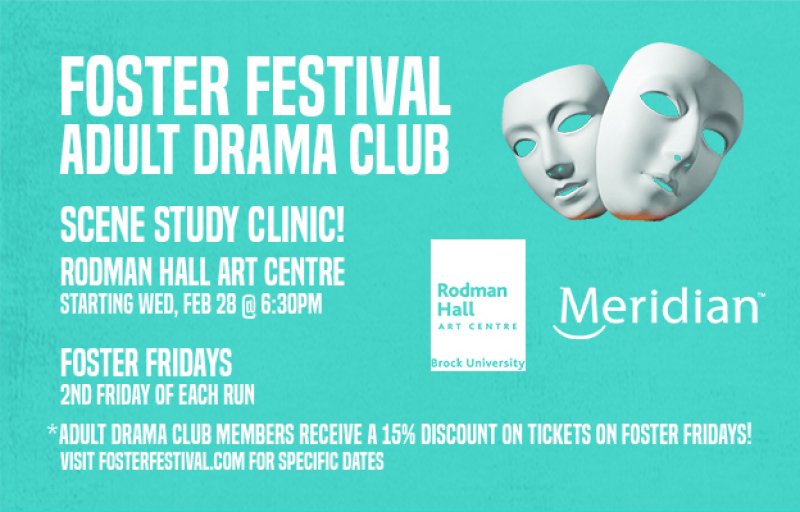 Adult Drama Club Members will be given the discount code at the Drama Club Sessions. 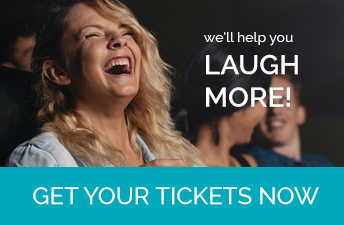 The performance will include a post-show Q&A TALKBACK with the Actors in The Foster Festival's new FORE & AFT LOUNGE at the Performing Arts Centre. Enjoy a coffee or raise a glass with us while enjoying an informal chat with the actors.